This dish is used as a side dish. This can be prepared with drumstick (maskasangi) flowers instead of cabbage. In North Canara, almost everybody has drumstick trees in their backyard. The leaves and flowers are used in many different dishes. Soak toor dal and rice in water for 30mins. Heat 1tspn oil. Fry coriander seeds and urad dal. Grind coconut, soaked dal, jaggery,red chillies, fried dal, coriander seeds and salt using minimum quantity (almost no) of water. Mix the ground masala with cabbage(or drumstick flowers) & onion. Make small balls and press with the palm to make it flat. Apply rava and shallow fry on a tava. Great site keep up the good work…all receipes r yummy..you can also make prawns voddi, substitute prawns instead of cabbage, they turn out great. Same goes for crab voddi too. Very Happy to see amchigele recipes. I used to deep fry without using rava. Your way looks more healthy. Need to try this. BTW I am trying your sunkta panna upkari . Thanks for sharing the recipes. They are awesome. Shilpa: Shubhada, please follow the seafood version of this recipe at clams vada. Looks too yummy ….I remember mom used to make these for me while she made the tisrya vadde for others, as i am allergic to seafood with shells…. Just a question though…. are we supposed to grind the fried/roasted urad dal and coriander seeds with the other masala??? Shilpa: Komal, thanks for pointing out. I had missed it in post. Updated now. Yes, they are ground with masala. Thanks for the mouthwatering recipe!! We call this dish ‘daangar’ in Goa and also use bamboo shoots-(kirla) in making it. 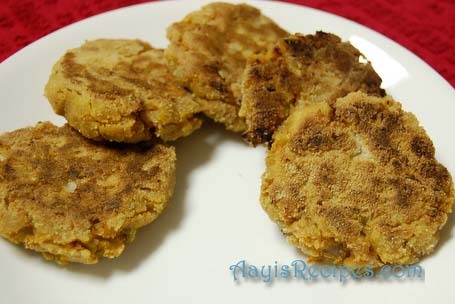 I love cabbage vada.. I tried this recipe yesterday.. Followed the same procedure.. The taste was good, but I was not able to make balls from the batter.. I fried it like sanna polo.. I dont know what went wrong..!! I still have some batter remaining.. How can I improve it so that I can make balls flatten and then shallow fry? Shilpa: Did you add water while grinding? you should not add any water if you want it to handle well. But some times with the mixers available here, we have to add it. When I do that, I add a little rava to the mixture and then make balls. it is excellant recipe of cabbage because many time we fed up with usual bhaji of cabbage .so that time we can prepared it . i m fond of cooking. i will also send some recipies to web. I would like to try out this recipe , it looks good. Just a question, should we cook the cabbage and mix with the grounded masala???? No, cabbage is not cooked. It gets cooked when the vadas are shallow fried.